WEB WISE WORLD INC. - WE MAKE WEBSITES WORK - WEBSITES, WEBPAGES, WEB SITE DESIGN, HOSTING, GRAPHICS, ANIMATION, ETC.!! Web Wise World has been creating and designing websites for several years. 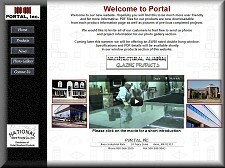 We use a conventional marketing approach to the proper design of a professional website. First, we meet with our prospective client to discuss what their specific needs are for their company's web presence. Often, the marketing advise our client takes home will even benefit them off of the web! Second, we use what we've learned about our client's business and we create a blueprint of the general architecture (types of links, design characteristics, framework, etc). From this we can proceed with the design and creation of a website that properly represents the client's interests and, using sound marketing principles, we can ensure excellent functionality of the website for our client's business!! To promote products and/or services. To provide a visual image of the company. To gain trust and credibility with customers and prospects. To incorporate an interactive marketing tool that compliments sales efforts. Additional e-mail accounts ~ $15.00 One Time Setup Fee Click on pics to visit websites! Click on pics to visit websites!